IPATH Reed Mid may be the shoe for you, if you don’t have a job and often hear “hippy” carrying through the night air. 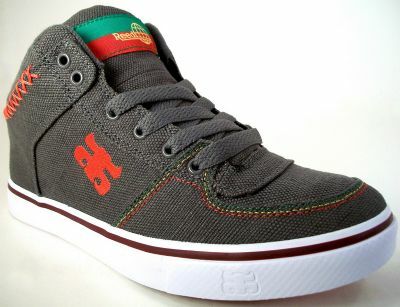 These Mid-Top all Hemp-Canvas Vulc shoes are the name sake of pro-skater Kenny Reed who does not have dreads, but maybe “jammin.” Just check out the Green, Yellow, and Red stitching around the toe-cap, Mon. IPATH is a legit skate company and all their shoes seem to be on the greener side, so if you need some new duds to skate to your dealer, er uh, the Food Co-op these are your shoes. The drug war has been harsh on hemp index, these numbers run 74.99 from CCS. Vegan in Waxed Black, Antique White, and Charcoal Rasta as pictured. Is it still possible to get these anywhere? Because I had a pair for 2 years and they are now worn out so I want new ones…they are the best shoes ever!! Ipath has been bought and sold a few times now. They still make shoes similar to their older styles, but the Reed hasn’t been available since we posted this.